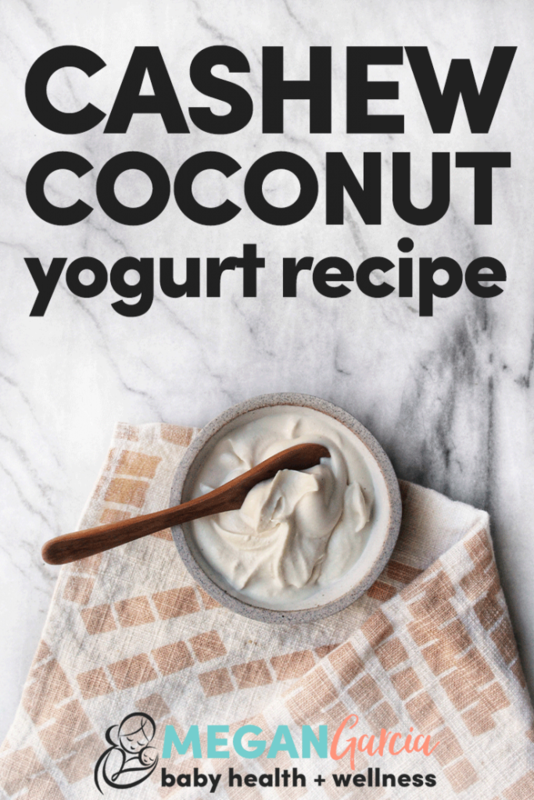 Are you on the hunt for a coconut yogurt recipe that’s thick and easy? Me too. Or at least, I had a strong hunch that all the coconut yogurt recipes with gelatin, agar agar, tapioca starch, thermometers, sweeteners, and canned coconut milk were missing something. I kept thinking to myself, it shouldn’t be this hard. Or complicated. Coconut is easy to ferment. Beyond that, I’m passionate about giving good food to babies. While I do love sardines, canned anything is less-than-awesome for mama and tiny tummies. So when I can skip the cans, I do. The other day I followed my hunch and did the one thing I had never heard anyone do but that seemed ridiculously obvious. That’s the secret to this #thiqq raw coconut yogurt with all the fluff you’ve been dreaming of. Not to date myself or anything, but literally 10 years ago I was fermenting blended coconut meat in my shower because I lived in a tiny studio at the tippy top of the Los Angeles mountains – with no kitchen. If you’ve ever fermented things, you know: Explosions happen. I had picked up the how-to from Donna Gates, who invented coconut water kefir. In those days, I would get young green coconuts, open them, and ferment both the coconut water and the meat. Using the Body Ecology starter, coconut water became kefir. And with a little splash of kefir or starter culture, you could ferment the coconut meat too. Fermenting all those bubbling jars of kefir and coconut meat taught me a couple things. For starters, coconut water and meat are naturally sweet. Which means that they’re easy to ferment since any starter culture you use – whether it’s a probiotic capsule or the Body Ecology starter – will need to feed on sugar. It also taught me that coconut meat – and by extension coconut butter – is fatty and fibrous. Fiber is fodder for microbes and this is exactly why you can ferment coconut butter. Because it’s fibrous. When you ferment the meat from a young coconut, it’s smooth and thick. But if you’ve ever eaten coconut butter, you know what it tastes like. It’s sweet, creamy, and there’s grit to it. That’s the fiber. And so we’re all on the same page, it doesn’t go away when you ferment it. That said, adding cashew butter softens the grit and gives the coconut yogurt a smooth and fluffy texture. When comparing this coconut yogurt to others on the market, it’s fair to say that this coconut just as thick and creamy – with a bit of texture. I’m okay with that, as most folks and wee ones could use more dietary fiber. I guess you could say I even advocate full-fiber, full-fat coconut yogurt. Because all the fiber feeds your bacteria living in the colon, which then go on to make short-chain fatty acids that protect against inflammation. If you’re pregnant, there’s even evidence that SCFAs speak to baby’s genes and optimize their expression. To make coconut yogurt, you’ll need a large quart jar and an immersion blender. Add warm water to a quart sized mason jar. Add the starter packet and set aside to bloom for 10 minutes. Next, add coconut butter and cashew butter to the jar with the water and culture starter. Blend with an immersion blender. Screw lids on the jars. Set in a warm place to ferment. I’ve successfully fermented coconut yogurt in my Instant Pot on yogurt setting for 8 hours. I’ve also fermented it by placing the jar on top of my oven (in a warm place) for 24+ hours. You’ll know the cashew coconut yogurt is done when it tastes sour. Place the jar in the refrigerator for one to two day, where it will continue to thicken. Have you tried making this cashew coconut yogurt recipe? Let me know how it went in the comments!